New Delhi’s cooperation with Washington is developing not only in the technologies sphere, but also in the military and political areas. Wooing India with offers of various kinds, Washington is trying hard to reorient New Delhi towards the West, and also to drive a wedge in relations between India and Russia. It has become apparent that the Americans are making great efforts to establish a military and political partnership with India, a major power that has traditionally gravitated towards maintaining good relations with Russia. US President Barack Obama paid a “historic visit” to New Delhi in January 2015 and, according to some analysts, the visit “ended an era of estrangement between the two countries”, which had lasted for decades. The main outcome of the visit was a settlement of the question involving the supply of US nuclear technologies to India. The Americans are seeking to oust the Russian company Rosatom from India. The main focus of talks was the US entry into the Indian weapons market, traditionally occupied by products from the Russian military-industrial complex. As part of the DTTI programme, four joint pilot projects were launched. These included the production of a new generation of lightweight drones, the RQ-11 Raven, containers with reconnaissance equipment for the C-130, portable hybrid power generators, and uniforms aimed to provide protection against chemical and biological weapons. Why all the talk about World War III? 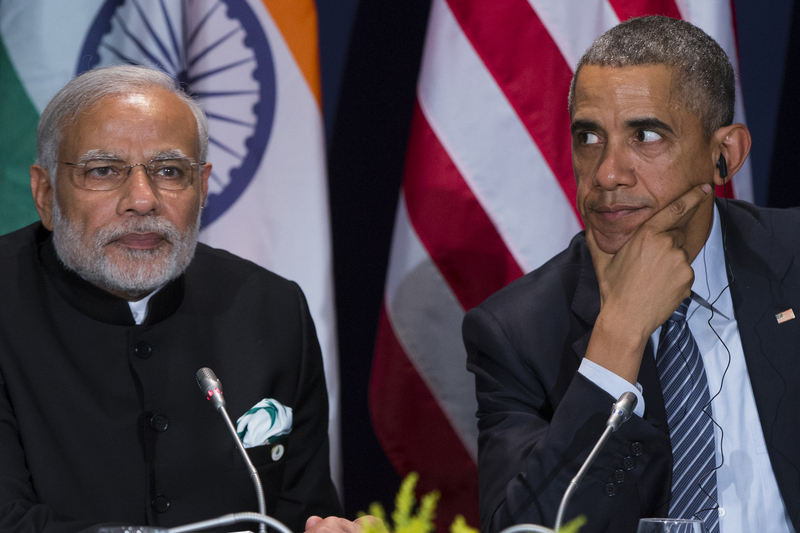 “In the footsteps” of Obama’s visit, Pentagon Chief Ashton Carter visited India in June 2015. His trip resulted in the two countries signing a ten-year framework agreement on defence cooperation. New Delhi’s cooperation with Washington is developing not only in the technologies sphere, but also in the military and political areas. India appears to be willing, more than ever before, to cooperate with the United States, in the background of strained relations with China. The Malabar 2015 joint naval exercises were held last year, involving naval forces of the USA, India, and Japan; to the displeasure of Chinese authorities. These were the first such exercises held since 2007, and India said these would become an annual event. During the preceding eight years, such exercises were not carried out because China objected to them, but now the regional powers are willing to aggravate their relations with China under the aegis of the United States. Analysts say the reasons for the escalation in tensions in South Asia are the growing territorial ambitions of Beijing. Adding to the long-standing conflict between India and China, concerning the disputed ownership of territories of Aksai Chin and Arunachal Pradesh, relations have been further exacerbated by competition for control over the South China Sea. This despite the fact that Delhi is not formally a party to the dispute between Beijing and Washington over the sea passage lanes, through which up to 50% of India’s trade travels. However, Indian politicians fear that China will not limit itself to the South China Sea, and will try to expand its influence towards the Indian Ocean as well. Strained relations with Beijing are pushing New Delhi into the arms of Washington and leading to some cooling of relations with Moscow. However, it is also clear that Russia cannot become India’s ally in its confrontation with China. India is vital for the Russian defence establishment. In 2013, for example, India accounted for around 35% of all Russian arms exports, and brought $4.7 billion in revenues to the domestic defence industry. New Delhi is firmly established as the major buyer of Russian military hardware. However, contrary to expectations, Indian Prime Minister Narendra Modi’s visit to Russia in December 2015 did not result in the signing of large contracts for the supply of military equipment. Modi preferred to go slow, and put off the signing of most contracts for an indefinite period. The only significant defence cooperation deal was signing of an agreement on the production, by the holding company Russian Helicopters, of 200 Ka-226 helicopters in India, within the framework of the “Make in India” programme. In recent years, India has been insisting on Russian defence products being manufactured on its territory. This is not very favourable for Russia, and creates additional difficulties in the production process; the technological base and Indian experts are not able to fully provide the necessary operating conditions. Partly for this reason, the programme to build a fifth generation fighter jet (FGFA) for the Indian Air Force was suspended. Although “on paper”, this fighter is ready to go, further work on the project has been stalled. India insists on parity distribution of all works between Russian and its own specialists, despite the fact that Indian aircraft builders are not yet ready to provide the necessary quality required for the production process. Also, at the end of last year, the Indian military abandoned the idea of ​buying Russian 155 mm self-propelled guns, the MSTA-S, opting instead to buy South Korean K9 Thunder artillery systems. Moscow intends on keeping New Delhi within its political orbit. During his meeting with the Indian PM Modi, Vladimir Putin said Russia was in favour of India becoming a permanent member of the UN Security Council, noting that it was “a great power, conducting a balanced and responsible foreign policy”. However, according to Vladimir Sotnikov, senior researcher at the Institute of Oriental Studies RAS, there exists no particular threat that rapprochement between India and the United States will lead to a deterioration of Russian-Indian relations. New Delhi should be able to stick to its multi-vector foreign policy, continue on its non-aligned course, which its leaders have been pursuing since the 1960s. “We should not assume that if India has undertaken a policy of rapprochement with Washington, it is moving away from Russia and BRICS. Prime Minister Modi’s goal is to support equal relations with all large countries. Our strategic partnership with India continues, and the Indian sides close relations with the United States will not have any negative impact on cooperation between Moscow and Delhi. The fact that the Indian authorities are seeking to diversify their suppliers, buying weapons not only from Russia, but also from the United States, Israel, and other countries, does not indicate any anti-Russian intentions on the part of Delhi,” the analyst said in an interview with the Russkaya Planeta. Sotnikov said Indian politicians are aware that one of the objectives of the White House is to damage Russian-Indian relations, along with countering the ever-growing Chinese influence in the region, but Delhi intends to stay aloof from this confrontation. Most analysts agree that Modi’s government was elected on the basis of its policy of pragmatism, and this is understandable because, despite the fact that in the first months of 2016, India has managed to overtake China in terms of economic growth rate, a large proportion of the country’s population still lives below the poverty line. Will India be able to maintain a balance in its relations between the strongest world powers; Russia, the USA, and China; which are trying to pull New Delhi in diametrically opposite directions? Washington, according to many analysts, is making every effort to derail the current Indo-Russian partnership, and it is hoped that Indian politicians maintain the necessary cool headedness, and keep at the right distance from their American colleagues, and not become involved in the confrontation between the West and Russia. The article is abridged. Read the full version published in Russian by Russkaya Planeta.